I love corn. I love to eat it. I love the look of it in the garden. I just haven’t quite figured out all of the tricks to successfully growing it. In the past I tried planting a couple of small rows, not understanding that it is a field crop and needs to be planted densely. The ears were pathetic, very few kernels, and they ended up in the compost. So this year I said, I’m going to grow some GOOD, non-GMO, heirloom, organic corn! So I prepped the area with lots of compost and manure. Let it sit, tilled it, and planted as soon as the area had sunshine. 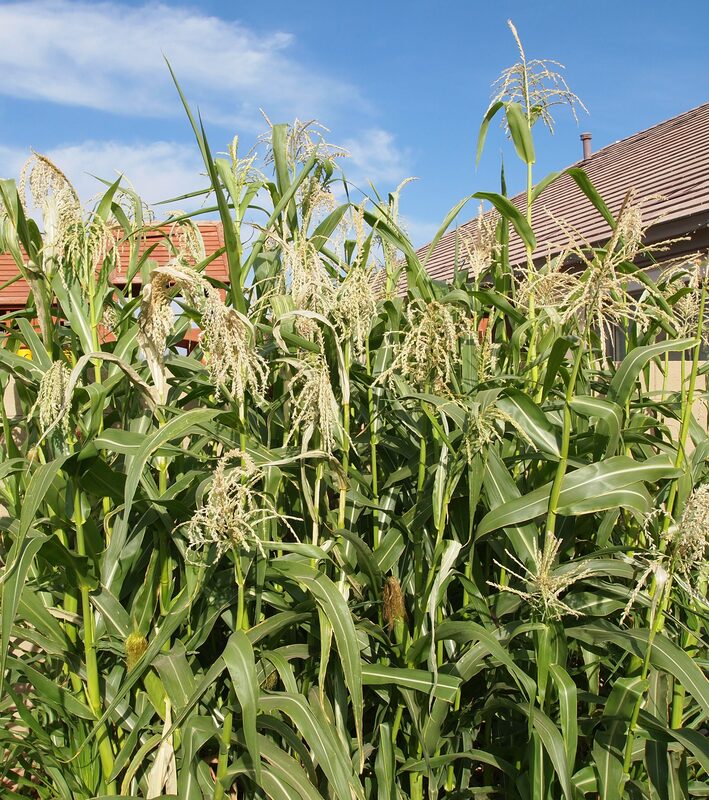 Almost every kernel sprouted and the corn has been growing great… until now. 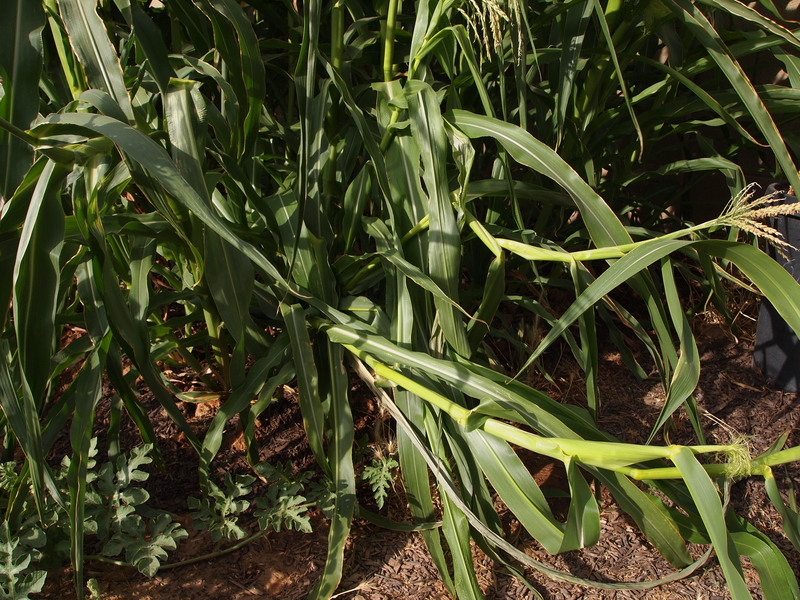 I seem to have a problem with corn just… falling over. It’s kind of a mess. I’m thinking if I do corn again I might put up some type of outer fence or maybe even do like a Florida weave on it. I don’t know I’m going to have to do some google searches and figure out what the best method is. With the planned garden expansion for fall I may be able to double my corn space next year so I definitely need to figure this one out. Driving in to work I drive past a bazillion corn fields that look so great. Maybe I need to observe them a little more closely and see what the trick is. This entry was posted in Growing corn. Bookmark the permalink. I don’t know anything about growing corn in your climate as I have to deal with high humidity in our summers here in Queensland. Different problems. A shame you can’t pick the brains of the farmers who are growing corn in your area so successfully. Perhaps you could? Commented on your other corn post then went back to look at this! Looks like the seeds might not be in the ground deep enough. I know they *say* one inch, but my Mexican farmer friend said 3 inches: at least! When I planted at one inch last year I noticed alot of roots were exposed, so I’m trying deeper this year. Also, corn need vast stands, but not grown densely. Heriloom corn typically needs at least 1 sq ft of space per plant, hybrids need less room. Plant too densely and with their high water/feeding needs they will stress out. Hope my suggestions are some help! That’s a great point. I had spaced based partly off what I had been seeing grown around here but considering some of those fields just got sprayed with Round Up (ugh), I would say they are GMO crops (not surprising given the percentages). The corn didn’t fall from the roots, so I’m not sure about the depth issue, although I am already planning on being cautious for this next year by starting the corn in a pseudo trench. I’ll describe that plan in a later post. That’s funny you mention the three inch planting. My family went to Mesa Verde last year and they mentioned the natives there actually planted something CRAZY, like 18 inches down and grew these little mini corn cobs. Fascinating survival techniques by those tribes. Thanks for your help! I REALLY appreciate it!